I found my old watch in my closet today. My dad gave it to me long time ago. I have kept it for years but wear it only a few times. 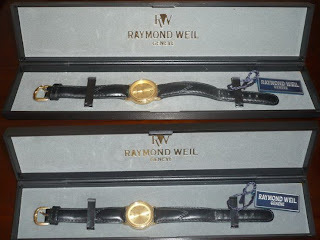 It is a Swiss, Raymond Weil watch. I've never valued it until I found out that it's really expensive. Whew! It's not working anymore so I thought I need to replace the battery with the new one. I went to the mall to have it repaired only to find out that the circuit (w/c the repair man refers to) is also broken. The cost of the battery is only P300 but the circuit repair is P1,500. What a price!!! A woman who is also there asked, "Bakit yung sa akin 300 lang, yun kanya mahal?" The repair man smiled and answered, " Swiss watch po kasi yun sa kanya " Having a second thought about the repair, I took my watch and left the place. Blaming myself for being careless. Hayayay! Later on I've realized its sentimental value and even if I could buy a new watch that costs P1,800, I'd still want it repaired. Upon searching on the internet, I found out that there are only four official retailers of Raymond Weil Luxury watches here in the Philippines. The nearest from my place is in Megamall. The name of the store is Chronos. I might go there next time to inquire about the repair.